Give your website the edge with a tailor made, responsive, attractive and functional design. We will custom design a website for your hobby, family, club, organisation, church, school or small business and produce the desired results with mobile-friendly design, easy navigation and great SEO. For eCommerce websites, choose the Advanced or Master Sitebuilder Plans that includes a secure online shop with online payment facilities. A custom design package charges you for the time and skills used to create and administer your website and not for the software used to set up your site. Thousands of WordPress and Joomla extensions (components, modules, widgets and plugins) are currently available to enhance your website. Some are free, some require a once-off payment and others require annual subscriptions. 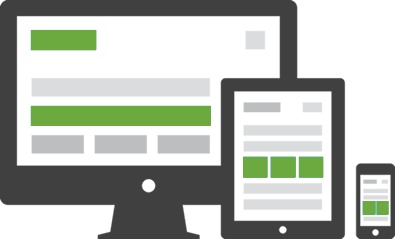 Responsive websites allow your site to adapt to different screen sizes which means that whatever device your web visitors are using they get the best possible view of your business or service. Mobile environments require simpler navigation, focused content and fast page loads. It has less clutter and is, therefore, easier to use. EziWeb uses two of the most popular CMS systems, namely WordPress or Joomla. They are both well tried and tested award-winning Open Source Content Management Systems which enable us to build websites and powerful online applications. Many aspects, including their ease-of-use and extensibility, have made them some of the most popular website software available. Should you prefer, we could even design your website with our Site.pro builder (drag and drop) and then hand it over to you for updates and maintenance. Websites ranging from small blogs to large Goverment sites run Joomla! CMS. To help you make an informed decision, we've compiled a list of our most frequently asked questions relating to the Custom Design Plans listed on this page. What could I expect to be part of any of the Custom Design Plans? 1. Hosting (disc space & bandwidth as per selected Design Plan). 2. The project development phase (scope, design, collecting of content, data, information, text, music, sound, images, etc.). You will be provided with our Website Planning Form to complete and return. 3. Setup of required e-mail accounts (up to the number allowed per selected Design Plan). 4. nstallation of Opensource (free) templates and apps, unless our monthly Software & Security Maintenance Plan which includes licensing of templates, website builders and security software is acquired. You may also provide or pay your own licensing to own the software. 5. Design and tweaking of pages and apps as allowed per selected Design Plan. 6. Design and apply other features and/or content as specified and acquired separately. 7. Final inspection and sign-off phase. 8. Technical (server related) customer support through our ticket system, unless our monthly Software, Security & Content Maintenance Plan is acquired. Each phase will be systematically worked through and will require customer feedback. The site will be hosted on a preview domain while being worked on. Who owns the content on my site? You will retain all applicable rights you hold in all content, data, information, text, music, sound, images, technology or software you legally owned and provided to EziWeb and all content we developed for you. EziWeb will retain all applicable rights it holds in any content it uses to provide services to you. All rights held by third-parties in any content will be retained by the applicable third party. Who owns the rights to the design on my site? EziWeb retains all rights to the design of the website we created where our licensing is used. That includes all Drag and Drop Site Builders (Site.pro, Divi (WordPress), JA Builder (Joomla)), WordPress and/or Joomla Templates. The timeline of a website design project is mainly dictated by the scale and requirements of the development and the timeous availability of your content (text/images/data,etc.). Do I have to pay a deposit for Custom Website Design? Yes. A deposit of 50% (excluding hosting and domain names) has to be paid before commencement of the Project Development Phase. The balance is payable on signing off of the project. How would I provide you with my content? You will be provided with a Google Drive link to upload your Website Planning Form together with all content (text/images/data,etc. ).